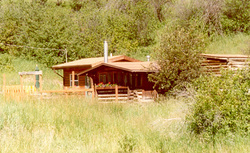 Brackett Creek Cabin is located 20 miles north of Bozeman in the heart of the Bridger and Bangtail Mountains. Bridger Bowl Ski Area is a quick drive 5 miles down the canyon, making Brackett Creek Cabin one of the closest rental properties. The Bohart Ranch, with many miles of cross country trails and home to the 2002 Us National Cross Country Ski Championships, also is just 4 miles away. Spring through autumn, Brackett Creek offers unexpected fly fishing rewards, with rainbow, brown and cutthroat trout to 15 inches. Of course, there are bigger rivers not far from here; to the west, the Gallatin, Madison and Jefferson are well known for superlative fishing. Brackett Creek Cabin is surrounded by public lands perfect for outdoor exercise ranging from a lazy walk in the woods to a challenging rock climb. Numerous trail heads in the Gallatin National Forest are within a few miles in all directions. On Forest Service roads leading up Grassy Mountain, you might see mule and whitetail deer, moose, black bear, bobcats, owls and eagles. A hike up 9600 foot Sacajawea, tallest peak in the Bridger's, affords a spectacular view west over the Gallatin Valley and of other nearby mountain ranges; the Tobacco Roots, Madison's, Gallatin's and others. To the east, you can easily see 30 miles to the Crazy Mountains. Brackett Creek Cabin is a four season vacation rental offering cozy accommodations for a family or group of five or less. There is one double bed to one end of the living area, separated by a privacy screen and in the bunk room are a set of high-low bunk beds and one twin. A recent addition to the cabin provides a complete kitchen and bath. The cabin is heated by a free standing propane stove. For your convenience, there is telephone service, CD player and a TV/VCR/DVD. All linens are provided. Brackett Creek Cabin was originally part of the Flaming Arrow Ranch on Bridger Canyon Drive. The Ranch was built during the 1930's as an artists retreat. Built all of logs, it features a woodland amphitheater, lodge and a number of smaller cabins for artists and visitors. Unfortunately, the founder passed away just two weeks before the retreat was to open. The property changed hands a number of times, for a time passing to the Boy Scouts of America, which used it as a summer camp. Later, a .private owner sold off some of the cabins, one of which was moved to Brackett Creek. You can view other parts of the Flaming Arrow Ranch by visiting the Silver Forest Bed and Breakfast, just south of Bridger Bowl. Directions: Brackett Creek Cabin is located about 20 miles north of Bozeman. From Main Street, take Rouse north; this becomes Bridger Canyon Road/State Highway 86. 17 miles from Main Street, take right on Brackett Creek Road. Cabin is on left, 2 miles from Bridger Canyon Road.